I grew up believing that the crockpot was invented specifically for this dish. All others crockpot recipes were a mere afterthought. Cholent (pronounced CHUH-lent) is a very thick and heavy long-cooked stew. After having a bowl-full, you won’t need to eat anything else for several days. It is a traditional winter sabbath meal. According to Wikipedia, cholent was first mentioned in 1180 CE. My local supermarket carries 3 different brands of cholent mix, but you can buy the ingredients individually. Pearl barley is barley processed to remove the inedible hull as well as the bran layer. You can cook cholent in a large pot on the stove, but for safety's sake make it during the day when you are around to check on it. Bloglines is a royal pain. bloglines.com, one of the bigger news/blog feed sites, hates my blog. It refuses to display updates, even if you choose All Items, since about my 2nd post. To see them, you have to click on the link to view my site. According to blogline's help page, my posts have invalid html or something to that effect. However, every other reader seems to handle my posts just fine, thank you. Mine isn't the only blog that has these problems. So I have reluctantly switched my choice of aggregator to Google Reader. Now all my feeds are feeding nicely. So if you use bloglines and notice that some feeds don't ever seem to have new posts, try using google reader or any other one. In 2008, Manischewitz (the matzoh company) had a cooking contest. The rules required using at least one of their products. I had created the following recipe years back and thought that, by converting generic products into Manischewitz ones, it might be a winner. So I submitted it. The deadline came and went, and, in keeping my perfect record (0 for 1,000, give or take) there was no contact from the company to tell me that I was a finalist. Eventually the finalists were posted on their website, and I was shocked (SHOCKED I tell you) to see a recipe that was pretty close to mine! That mean ol' finalist had a few differences in his recipe, and (I have to admit) his WAS little simpler, but Wah! Wah! He got picked instead of me! I still like mine better *sniff*. Strawberries are much more better than cherries with chicken. Except next time, I might try copying his, I mean using, balsamic vinegar instead of the cider vinegar. 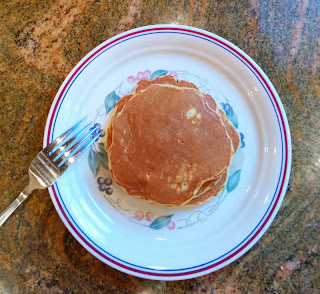 For some reason, today daHubby asked for pancakes. Luckily, this is a day where I do not have to go to work. But I still didn't manage to make the pancakes until lunchtime.